New and revised for 2019! Achieve proper claims submission with this comprehensive resource. Filing insurance claims is often a challenge for dental teams, so make sure your staff is prepared. From reporting the wrong CDT code to not sending the correct supporting documentation, improperly filed claims cost you time and money. This easy-to-follow guide offers solutions for both common and complex submission problems. 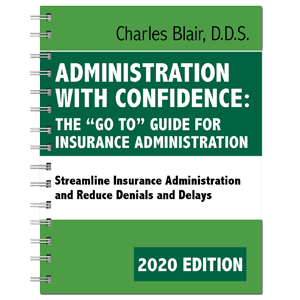 Successfully navigate the difficult ins and out of dental insurance with Administration with Confidence.